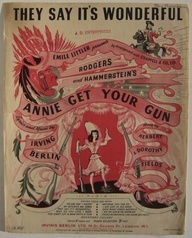 This beautiful Irving Berlin love-ballad was first sung by Ethel Merman (and her male partner, Ray Middleton) in ANNIE GET YOUR GUN (1946) — and it has been treated lovingly by all manner of singers and instrumentalists — Sinatra and Ruby Braff, Johnny Hartman and John Coltrane, Doris Day, Sonny Stitt, Jimmy Scott . . . But this song got a lovely, sweetly swinging performance last Sunday, September 30, at The Ear Inn (326 Spring Street, Soho, New York) because of those Masters of Wonder, Jon-Erik Kellso, trumpet; Dan Barrett, trombone; Joe Cohn, guitar; Joel Forbes, string bass. I think that “wonderful” used to mean worthy of our amazed admiration, full of wondrous things. It seems an appropriate description for the music at The Ear Inn every Sunday night from 8 – 11 PM.